How Does a Hydraulic Cylinder Function? A hydraulic cylinder is a mechanical device that provides power through linear movement. Hydraulic cylinders are used in a wide variety of applications, including heavy duty vehicles, construction equipment, snow removal equipment and earth movers. The primary purpose of hydraulic cylinders is to control the movements of a machine's linkages and attachments, such as the snow plow or earth scoopers. A typical hydraulic cylinder consists of a barrel, a cylinder cap, a head, a piston and a piston rod. Most cylinders are made from nickel, chromium, stainless steel or another type of strong and durable metal. Hydraulic cylinders operate through pressurized fluid (usually oil), which gives the hydraulic cylinder force. The cylinder's driving force is the piston, which is attached to a piston rod that is enclosed in the cylinder's barrel. The bottom of the barrel is closed off by the cylinder cap, and the top is closed off by the head. The head contains a round hole, which allows the piston rod to come out of the barrel. The inside of the barrel contains the oil, and the hydraulic pressure that the oil creates acts on the piston rod, causing it to move back and forth in a linear fashion. One end of the piston is attached to the object or machine it is responsible for moving; as the hydraulic pressure of the oil moves the piston rod, the piston rod moves the piston, which in turn moves the attached object. There are two main types of hydraulic cylinders: tie rod cylinders and welded body cylinders. Tie rod hydraulic cylinders contain threaded steel rods attached to either end of the cylinder barrel. These threaded steel rods are extremely strong and make tie rod cylinders useful in heavy-duty industrial applications. Welded body cylinders have no steel rods; instead, the top end of the barrel is welded directly to the object it is designed to move. Because they have no steel rods, welded body cylinders are much smaller than tie rod cylinders and are used in smaller machinery. 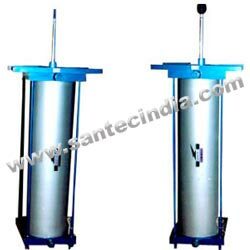 Welded body cylinders are the main hydraulic cylinders used in construction machinery. There are other types of specialized hydraulic cylinders, including telescoping cylinders that allow the piston rod to retract into the barrel. Specialized hydraulic cylinders are primarily used in custom machinery and specialized industrial equipment.